Over the years, the general public has become familiar with the term “Moore’s Law.” Moore’s Law was named after Gordon Moore, the co-founder of Fairchild Semiconductor and Intel (they make the main chips in most of our computers). In 1965, Gordon Moore stated that, “the number of transistors in an integrated circuit doubles approximately every two years.” Since 1965, Moore’s Law has been remarketed to encompass not just computer chips but technology in general. After all, if the computer chips that run our computers double in power every 2 years, then it stands to reason that ALL technology doubles in power. While not exactly accurate, this concept does market well. Regardless of the details of Moore’s Law, one thing we all know is that technology changes, and often changes fast! In fact, by the time this blog is posted, more than a million technology changes have probably taken effect. Most of these we will never know much about; minor code changes, fixes, and feature enhancements. Here at Bellevue College Continuing Education, we keep up with these changes – both minor and major. We are particularly focused on the major changes that, not only will impact our student’s career opportunities, but be of benefit to our local employers. Being concerned with, and observant of, technology changes is not enough for us. Our mission is to ensure that we offer relevant programs that teach the skills employers are looking for. Aligning our curriculum with employment requirements helps us bridge the gap between what we teach and what will get our students jobs. • MS SQL Database programs – A new version of Microsoft’s flagship operational database, SQL Server 2017. This new edition of SQL Server has added Python, graph processing and runs on Linux. Look for SQL Server 2017 instructions coming in the fourth quarter of 2018 combined with our current Python program. • Apple Development – iOS Development is back. Yes, we are bringing iOS development back in an “intensive” format. This format will allow students to more rapidly complete the program while receiving more instruction both in the classroom and online. Students will learn to develop apps for iPhones, iPads and Apple TV. By Spring Quarter 2018, we will be adding Apple’s ARKit development. • Immersive Reality Technologies – One of our most exciting new offerings is the growth of Immersive Reality technologies. These technologies include: Augmented Reality, Mixed Reality and Virtual Reality. We have already begun to offer the first step into this exciting world with courses in AR/VR HoloLens Development and Immersive Realities Design. Soon, we will be adding a course in Apple’s ARKit. If you are unfamiliar with Augmented Reality, for all the iPhone/iPad users, check out this IKEA video: https://youtu.be/-xxOvsyNseY. • The Internet of Things – To round out our new changes, we are excited to offer a course in the Internet of Things (IoT). Experts predict that there will be over 24 billion devices (sensors) installed by 2020. Imagine controlling all of your home or office heating and lighting from your phone, or having your refrigerator alert you to the fact that you need milk, or using your phone to diagnose a car problem before you take it in. You could walk into the mall and use your phone to find who has the best price on the clothes you were looking for, then order and pay for them before you get to the store. Many of us already use health monitoring devices like the Fitbit, or make payments using our phones. These are just a few ways IoT technology is, and will, impact our lives. A recent Google Jobs search showed over 700 jobs for people with IoT skills in the Seattle and Bellevue area. 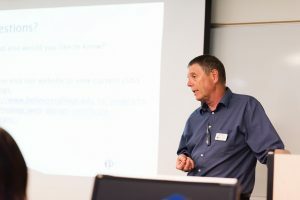 The Computer and Technology program is always working to stay connected and informed on the latest technologies that impact our students and employers. Instructors are working professionals in the program areas they teach, and many of our students are actively engaged in the technology world. Every day they bring us new ideas, new directions, and new opportunities that keep us changing, growing, and better equipped to offer new and exciting programs for our students and community.